It feels like it’s been way too long since I’ve done a book haul right? I just looked and the last book haul I done was at the beginning of August which is just not acceptable! 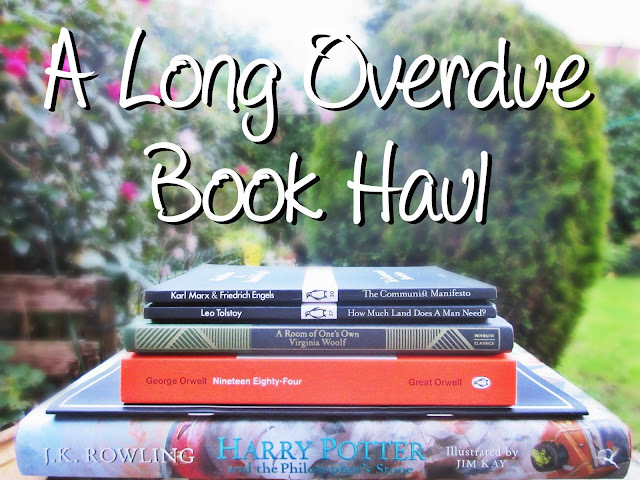 I decided gathered all the books I got in the months of August, September and October to show you because who doesn’t like a book haul, or any haul in fact? Well I promise it’ll be a good one so sit back and relax while you have a nosy at the fabulous books below! Both of these are from the Penguin books 80th anniversary collection because I just can’t get enough of them! The first one talks about “one of the most important political theories ever formulated” and the second one includes short stories about greed, charity and death. I can’t be the only one that’s drawn to those? Well they both definitely caught my attention and at 80p each, I couldn’t resist! I’m about to start reading this as we speak so I don’t want to give too much away as I’m thinking of writing a review after I’ve finished. All I’ll say for now is that it’s a feminist essay based on lectures delivered at Newnham College and Girton College in 1928 however the narrator is fictional so I’m interested to see how that turns out! Yay another classic book to add to my collection! Apart from me being fan of reading dystopian fiction, my reason for getting this book was because of the great reviews. Obviously I wouldn’t have bought it if didn’t at least a little bit of interest in it but I genuinely felt like I was missing out by not reading it, call me crazy! I follow Sarah on Twitter so when I saw that she had released a comic with Josh, I couldn’t not check it out! It’s a fascinating combination of short stories, poetry and artwork so if you’re a comicbook fan like me and you’re looking for your next read I would highly recommend this unique thing. You can tell how much hard work they put into it so take my word for it when it’s worth it! Yes I did buy the illustrated version of the first Harry Potter book, you can’t be THAT surprise? That week the book was published, my friend asked me what the difference was and I think I answered it perfectly: one book has a great story and the other has a great story with beautiful drawings. Enough said! Oh go spoil yourself 😉 haha well I hope you get your hands on it soon because it's B-E-A-UTIFUL! Can we see a blog post about Harry Potter illustrated book ? How do you showcase your book collection in your home?? I'd love to see all of the books you own and how you organize them in your space 😀 Thanks for sharing! Oh that's a good question 😉 I'll definitely have to do a post on my book collection in the new year!! You should really get the Harry Potter book because the illustrations are amazing, Jim Kay is so talented! I've held the Harry Potter and the Philosopher's Stone: Illustrated Edition in my hands, but I didn't buy it. I really don't know why I didn't. It so gorgeous! Great haul! I need that harry potter book! Such a great haul! I'm a big fan of Virginia Woolf but haven't read 'A Room of One's Own'. I'm looking forward to your review!